Check out this amazing critter that I found feasting upon my morning glories. 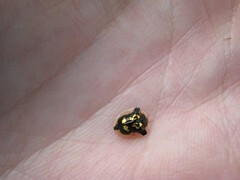 I believe it is a fool's gold beetle. The bottom edges of the shell are transparent, and the gold markings are shiny and metallic.